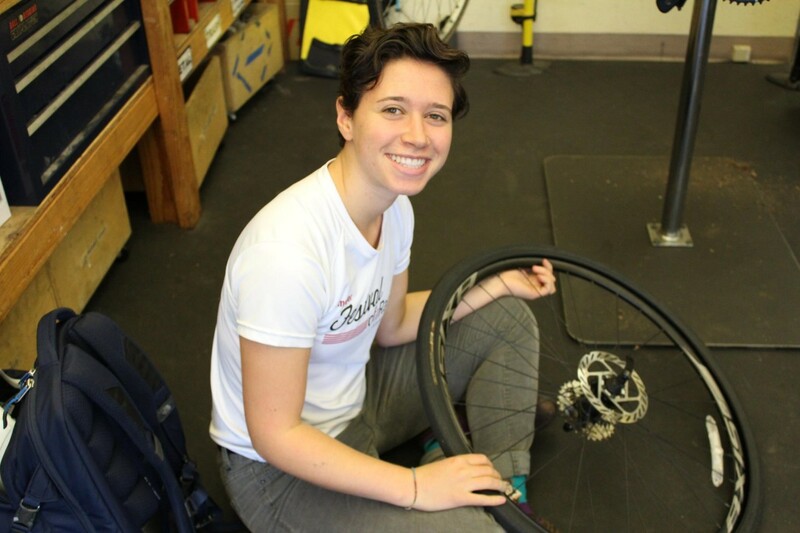 Rebecca joined the Community Cycling Center as a Communications Intern in 2015. Rebecca is a multi-talented volunteer. From writing to photography to speaking several languages, she can do it all. She supports multiple departments within our organization and helps us share many powerful stories about our programmatic work. We sat down with Rebecca to learn more about her passion for bikes and volunteering. Biking is one of the most empowering experiences. There’s something about getting from place to place using the power of your own body that feels so powerful. Additionally, getting that extra time outside is so important for both physical and mental health. I believe that access to the benefits of biking shouldn’t be a privileged opportunity. Everyone should have the opportunity to bike. That is the core principle of Community Cycling Center, so I’m happy to do whatever I can help them in their work! I spent a summer in Traverse City, Michigan working for the Michigan Land Use Institute and they did some collaborative work around biking and transit generally. Also, it was the first time in my life where biking was my only form of transit and I fell in love. People started telling me I should go to Portland. I starting asking around for non-profits that promoted biking in underserved communities in Portland and Community Cycling Center was the first to come up! I help with communications with Melinda and I also help with programming with ABC and the mechanic class elective class being taught at Rosemary Anderson. I know everyone says this, but the Holiday Bike Drive was so cool. The atmosphere was incredible and such a unique experience. Part of what makes it so incredible is the scale of the drive. There are so many people who come out to help in addition to all the families with their kids. Seeing how excited the kids get about biking is so fun. Also, the organization of the drive really stuck out to me. It’s a program that encompasses a lot, like many CCC programs. From the series of educational presentations about hand signals and the importance of helmets, the fittings, the selection of the bike, the final maintenance check, to the first time the kid gets to try the bike out are integral to assuring kids leave with the knowledge and tools to be great bikers. I really love the bike mechanic classes at the high schools. I’ve been part of the elective series at NAYA, Helensview, and Rosemary Anderson. I love seeing the kids being faced with a problem with their bikes and what happens when you hand them a tool. That moment when their faces light up with excitement and joy when they are able to solve the problem is amazing. To me a community is a place and group of people that support one another in reaching one another’s potential in all areas of their lives (work, live, and play). I love to run and bike and sometimes I like to bike places to run, but I have the problem of always having to return to wherever I lock up my bike. I wish I had a bike that I could leave on one end of a trail and would meet me at the other end of the trail. If it could bring me some water and a snack, that’d be great too! I have a sock collection that I’m pretty enthusiastic about. It’s not a super-gratifying hobby, because no one ever sees them really, but that makes it something that is more for me. My favorites are funny or silly socks. I love the ones they sell at Powell’s.